— and the Co-op strives to keep up with you all. When we built our Ends Statement, it was clear that as a community, our goals are much bigger than bringing unique produce and local ingredients to the Palouse. We, as a collective group of dedicated grocery store owners, also strive to increase access to healthy, sustainable food for everyone. Food accessibility is a major concern of our owners and a driving factor in our business model. We live in one of the richest agricultural hubs in the northern United States, yet too many families on the Palouse struggle to get adequate nutrition. One way we understand this problem is through food security, a metric developed by the US Department of Agriculture. A household is considered food secure if they meet two standards: the ready availability of nutritionally adequate and safe food, and the assured ability to acquire that food. In 2016, the USDA found that around 12 percent of households nationwide were food insecure. Much more alarming, however: on the Palouse, that number is as high as 18 percent. This information has made it all the more vital for us to provide services like our FLOWER program. Through FLOWER, an acronym which stands for Fresh, Local, and Organic Within Everyone’s Reach, families who qualify for state or federal benefits — including SNAP, WIC, Medicaid, or free or reduced school lunches — receive a 10% storewide discount every time they shop at the Co-op. FLOWER is a powerful tool to help increase food accessibility for those among us who are in need – and it isn’t the only one in our toolbox. We're delighted to see our owners work hard through Co-op programs to support local food banks. We provide a food pantry shelf at the front of the store, as well as the opportunity to make direct financial contributions at our check-out lanes. Co-op shoppers can choose to purchase donations in $5 or $10 denominations for products that go directly to local food banks. Through this program, you, our customers and owners, donated over a ton of food (2,053 lbs., to be exact) to food banks in 2017. And this doesn’t even count the bread that was donated – our bakery alone contributed more than 3,500 lbs. of nutritious bread last year. One of our vital partners in this endeavor to reduce food insecurity on the Palouse is the Whitman County Community Action Center (CAC). This Pullman nonprofit is an outstanding resource hub for Whitman County residents who struggle with food insecurity. Many of our food bank contributions went supported food packaging projects at the CAC, thanks to help from Washington State University’s Center for Civic Engagement. 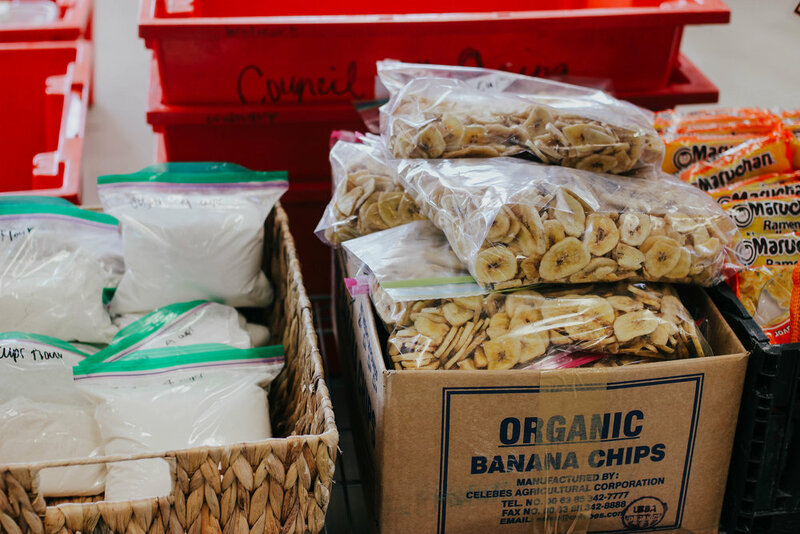 These events turn our bulk food donations (lentils, pasta, banana chips, and other staples) into grab-and-go bags for easy pick-up by community members during food bank hours. CAC Food Bank Manager Ashley Vaughan asked us to keep in mind that hunger doesn’t go away during the spring and summer. The holiday season is typically the busiest for food banks, but it's always a good time to pitch in and contribute healthy, delicious ingredients to local families. It takes a combined effort from everyone in our community to reduce food insecurity. You have the power to change someone’s life for the better – and the Co-op can help you do it.